I have an urge to go to school again but not sure what to get which I can earn directly and then one lovely afternoon, my DH told me why not I (oops not only me actually, he said "we") be going to take GIS (Geographical Information System) class. Oops I just have to take class 120 only which is only a subject. He said so I will know what GIS is. Ooh I haven't tell you that this is also in demand talking about engineering works. And ooh many jobs to get and pays well when one has a certificate or diploma. 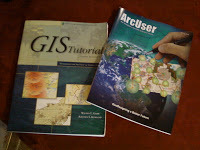 By the way, I still have a lot to read what GIS is and what major to get since there are many fields when talking about such. What is my first impression about this is talking about GPS system. It is just not clear how employee from GIS class could get it which I want to know. But the big question is should I get it? We have some plans for next year or a year after it. It is just that it is confidential to tell in public yet. Ha ha ha! I just realize that if I could not finish it, it is better not to take it for now which in short, I could get it time would permit. Ah! Time is gold, I so do believe it. But then, which should I/we prioritize is what it matters. Hemm.. brain teaser huh! He he..
good luck madam sis...ako ambot alng ani kung magbalik bako ug skul or mag work bako..waaaaaa...ehehhee! wala pako kadungog ana man.